Heat oil in a cooker.Add chopped onions, fry till golden brown. Add tomatoes and cook till raw flavour goes off. Add curd, lime juice and Aachi Briyani Masala followed by mint leaves and coriander leaves. 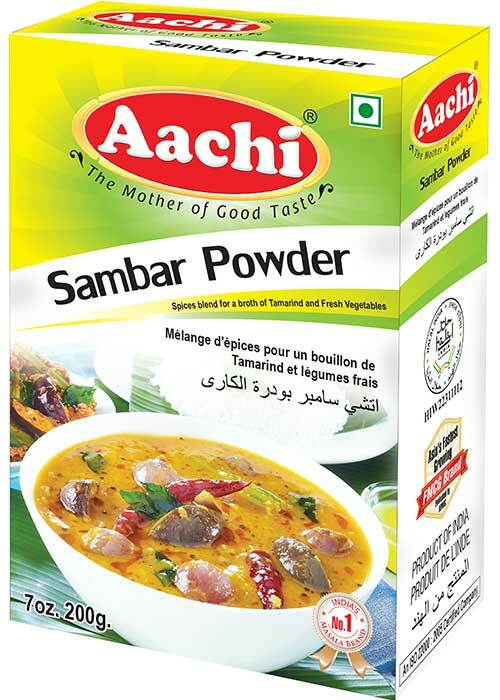 Add vegetables / pressure cooked mutton / chicken, 1 litre water, salt and rice. Pressure cook till 3 whistles. 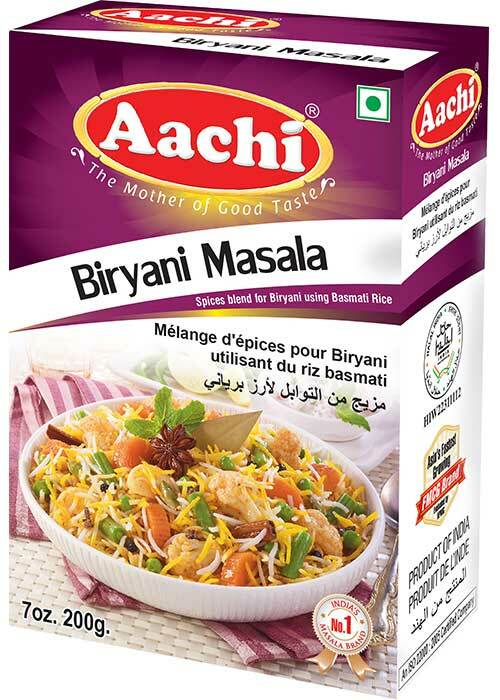 Finally top the rice with ghee and mix well. Tasty Briyani is ready-to-serve. Chilli, Salt, Cloves, Coriander, Cardamom, Cinnamon, Aniseed, Ginger, Garlic, Onion, Nutmeg, Staranise. 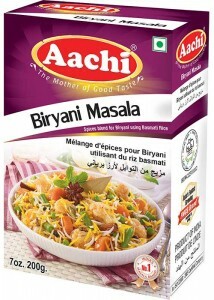 Fry vathal in required quantity of edible oil. Heat gingelly oil, add mustard seeds, dried red chillies and saute. 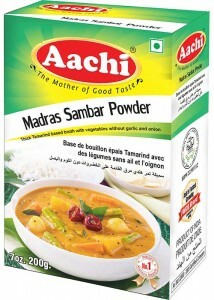 Add curry leaves, garlic, onions, tomatoes and cook well. 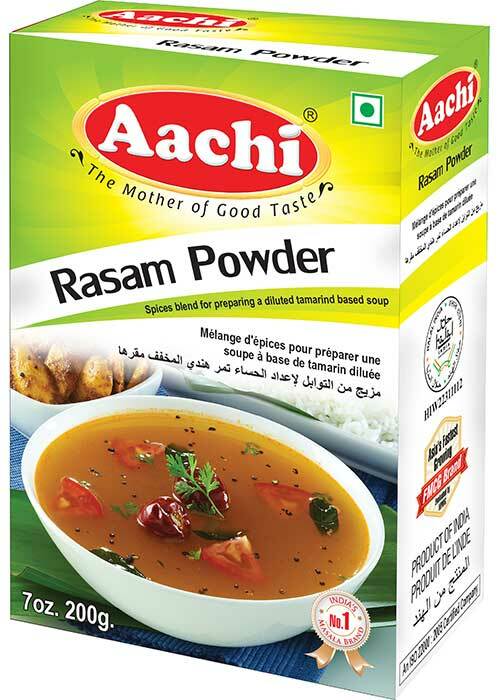 Add 50g Aachi Vathakulambu Masala and 500ml of water. Then add coconut milk, fried vathal and salt. Tasty Vathakulambu is ready-to-serve. 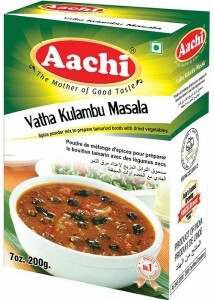 Option1: Fry few garlic, small onion & finely cut tomatoes along with vathal and prepare as above. 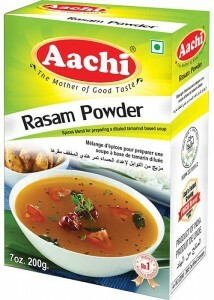 Option2: Instead of vathal fry cauliflower / Drumstick / Mushroom / Ladiesfinger (200 gms) in oil along with option. Grind 1 tomato with little coconut and add at the end before removing from fire. Cut 150g of cauliflower into small florets, wash and keep it aside. 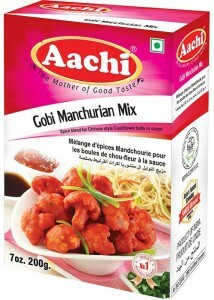 Add 20ml water to 20g Aachi Gobi Manchurian Mix. Mix to obtain a thick batter. Mix the cauliflower florets in the batter and set aside for 2 minutes. Deep fry the florets in a medium flame until golden brown for 5-6 minutes. Heat 20ml of oil to fry chopped onion, ginger, garlic and capsicum to saute. Add 150g Tomato Ketchup, 15g of chilli sauce, salt, pepper (to taste). Cook for 2-3 minutes. 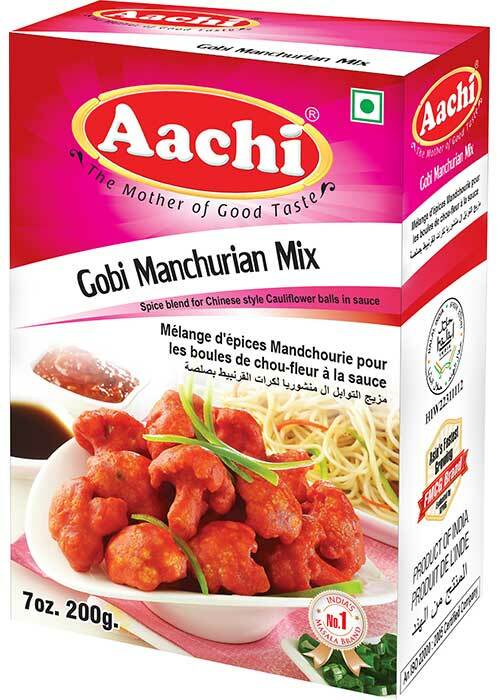 Now Tasty Aachi Manchurian Gravy is ready. 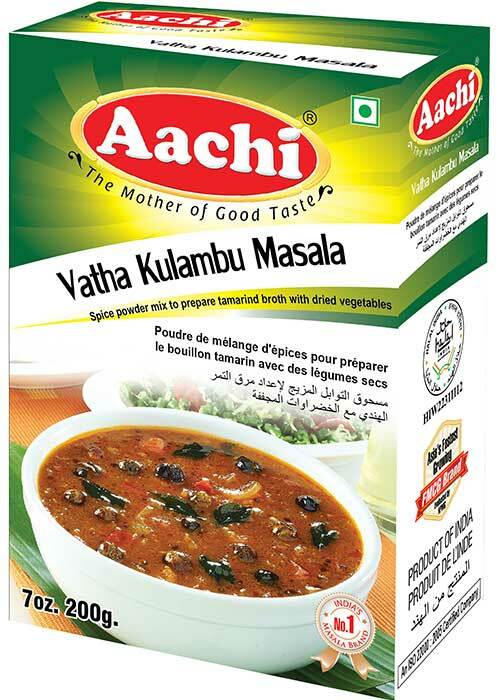 Garnish with finely cut coriander leaves and serve hot. Boil 1/2 kg rice and keep aside. In edible oil fry mustard seeds, onion, urad dhal, curry leaves,red chillies. 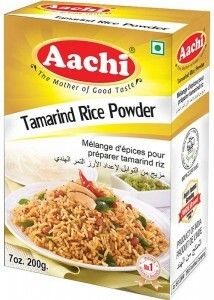 Add Aachi Tamarind rice powder and 50 ml of water. Add required quantity of salt. Saute for sometime. Mix the seasoning with 600g of cooked rice and mix well. 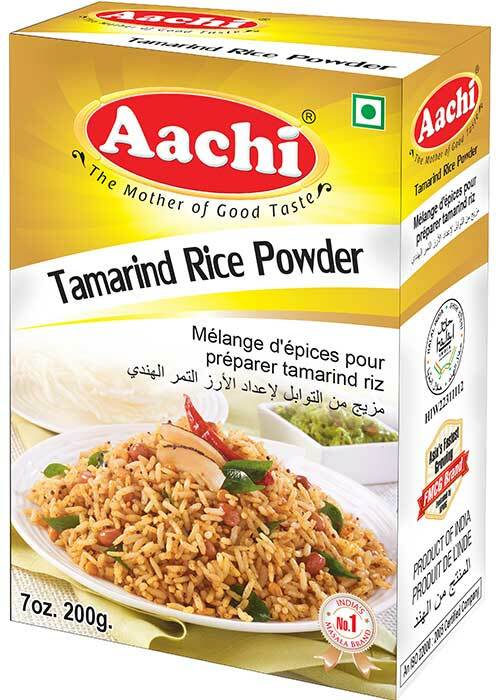 Now tasty Tamarind rice is ready-to-serve. For more taste keep aside for 1 hour and serve. Boil 250g of rice. Heat the oil to add mustard seeds, urad dhal, red chillies and curry leaves. 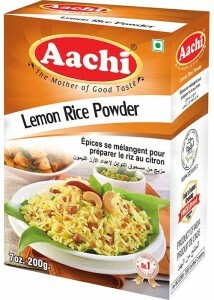 Add Aachi Lemon Rice Powder. Add 50ml of water and desired quantity of salt to taste. Saute for a fine blend. Mix the prepared seasoning to the pre-boiled rice. 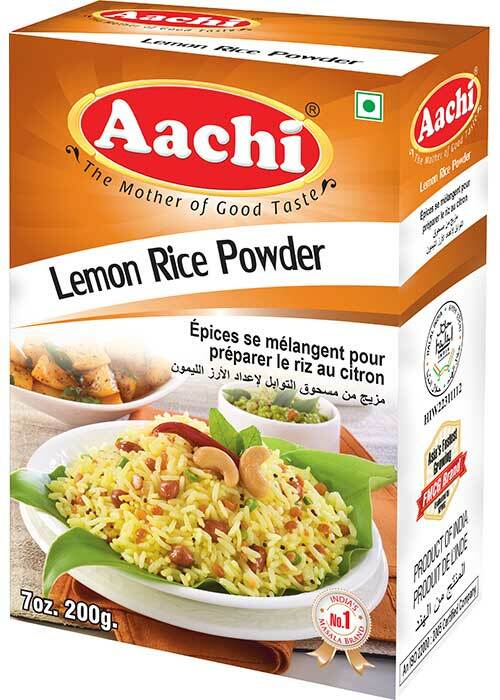 Now tasty Aachi Lemon Rice is ready to serve. 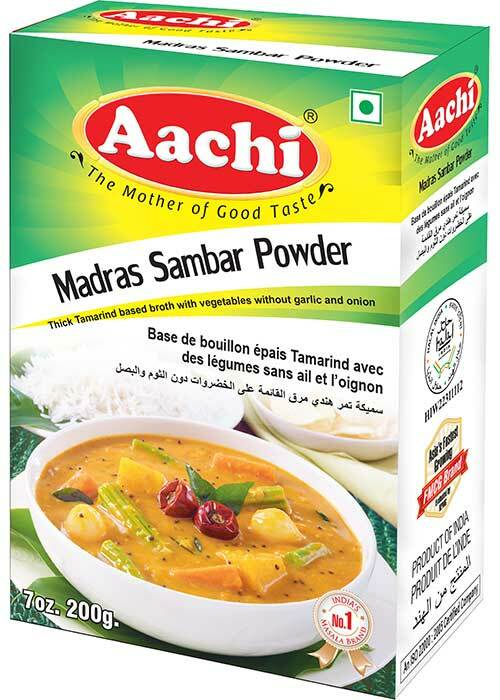 Moong Dal, Urad Dal, Salt, Lemon Salt, Asafoetida, Turmeric, Chilli, Mustard, Curry leaves. Heat oil in a kadai. 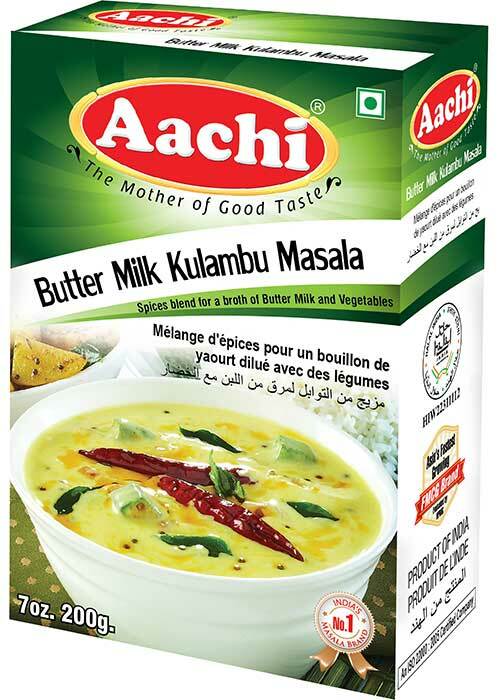 Add mustard seeds, urad dhal, red chillies, ginger garlic paste and curry leaves. Add Aachi Tomato Rice Powder. Add 50ml of water. Add required quantity of salt. Saute for sometime. 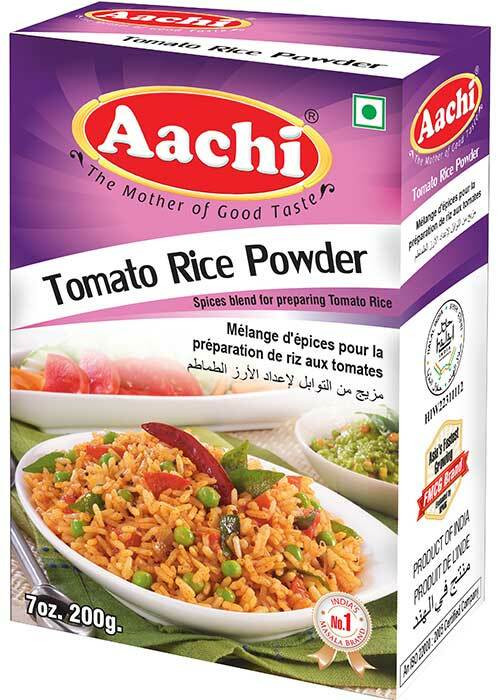 Mix the seasoning in 250g of cooked rice.Delicious Tomato rice is ready-to-serve. Coriander, Red Chilli, Cinnamon, Cloves, Fennel, Cardamom, Jathipathri.